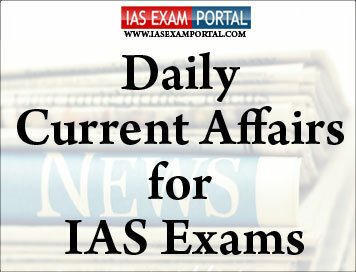 Current Affairs for IAS Exams - 05 February 2019 | IAS EXAM PORTAL - India's Largest Community for UPSC Exam Aspirants. Leaders of several Opposition parties approached the Election Commission of India (ECI) on February 4 and sought redressal of the issue of alleged tampering of electronic voting machines (EVMs). They urged the poll panel ensure that 50% of EVM results are matched and cross-checked with voter verifiable paper audit trails (VVPATs) before the declaration of results in the coming Lok Sabha elections. They told the ECI that people doubted the efficacy of EVMs and this issue needed to be redressed.The Opposition delegation met the Chief Election Commissioner and other members of the panel. Opposition parties had sought moving back to the ballot paper system, but after the ECI made it clear that there is no possibility of going back to the old system, they changed their strategy and are now demanding matching of 50% EVMs with VVPATs. The Opposition leaders earlier met in Parliament and discussed their strategy on the issue. Home Minister Rajnath Singh on Monday said there may be a constitutional breakdown in West Bengal in the wake of the Kolkata Police-CBI face-off and asserted that the Centre has power to take action. Making a statement in Lok Sabha on the prevailing situation in Kolkata, Mr. Singh described the action against the CBI probe team, which went to question Kolkata Police Commissioner Rajeev Kumar, as “unprecedented” and a threat to the federal political system of the country. Members from Trinamool Congress, Biju Janata Dal, NCP and Samajwadi Party spoke against the CBI move to question the Kolkata police chief. A CPI(M) member said both the Trinamool Congress and the Centre were at fault. Commerce Minister, Suresh Prabhu,in his address at the first state level awareness programme on agriculture export policy said that in order to achieve the purpose of the policy clusters have been identified across the country for development of agriculture exports. Farmer Producer Organizations (FPO’s) and co-operatives should be linked with the farmers and exporters. Required infrastructure needs to be provided in these clusters and use of latest technology in agriculture has to be adopted. He also stressed on attractive packaging in order to increase the demand for the identified products. Indian Institute of Packaging has been roped in for working on packaging standards for international markets. It is required to have a “Farmers’ Centric Approach” for improved income through value addition at source itself which will help minimize losses across the value chain. Suresh Prabhu informed that the Agriculture Export Policy has been prepared jointly with the state governments and will be implemented by the concerned state agriculture and horticulture departments. Ministry of Coal entered into a Memorandum of Understanding with Ministry of Energy, Republic of Poland here today. The MoU has been signed between Sh. Haribhai Parathibhai Chaudhary, Hon'ble Minister of State for Coal and Mines and Mr. Grzegorz Tobiszowski, Secretary of State, Ministry of Energy, Republic of Poland. Speaking on the occasion, the Minister of State for Coal and Mines, Shri Haribhai Parathibhai Chaudhary said that India and Poland celebrated 60 years of vibrant diplomatic relations and also formalized cooperation agreements in different areas and he expressed hope that the MoU signed today would further strengthen these efforts. He also complimented the officials from Poland and India for identification of areas of cooperation and the development of this MoU after consistent engagements. He added that the MoU will greatly benefit in the field of clean technologies and would provide opportunities to both our countries to augment trade and investment in diverse areas in mining and energy sectors. He conveyed expectation that the joint working group created under the MoU would work very closely to take the aims of the MoU further in a time-bound manner. He further added that he also foresees a very strong scope for cooperation in other areas of mining in India. British Home Secretary Sajid Javid has signed the order for the extradition of liquor baron Vijay Mallya to India. The businessman whose legal team had previously indicated their intention to appeal the extradition will now have two weeks to lodge an appeal. The signing of the order on February 3 came just a few days shy of the two-month window from the date of judgement December 10, 2018 within which a decision had to be made. Under Britain’s extradition rules, Mr. Javid had two months from the date of the judgement to determine whether to order the extradition. In making extradition decisions, the Minister has to consider issues including whether the death penalty would be involved or the person be extradited to a third country (neither of which would apply in this case). Anand Doobay, lawyer for Vijay Mallya, who faces charges of money laundering and fraud in India, had confirmed late last year that he intended to appeal the extradition order once it was confirmed by the British authorities. Late last week, Mr. Mallya took to Twitter to criticise Indian authorities and the banks, accusing the latter of pursing “multiple frivolous litigations” against him. He accused the banks’ lawyers of objecting to him paying “legitimate tax dues” in the U.K.
France, Britain, Spain, Austria, Sweden and Denmark on Monday recognised Opposition leader Juan Guaido as interim President of Venezuela. The coordinated move from major European nations came after the expiry of an eight-day deadline they set last weekend for President Nicolas Maduro to call a new vote. Mr. Maduro said on Sunday that he would not give into ultimatums. He has so far rejected calls by European countries to call an early election. He has offered to call early parliamentary elections instead. The Venezuelan leader, accused of running the OPEC nation like a dictatorship and wrecking its economy, has defied that, saying Europe's ruling elite are sycophantically following U.S. President Donald Trump's agenda. Mr. Guaido, who leads the Opposition-controlled National Assembly, declared himself temporary leader on January 23 in a move that has split global powers. Mr. Trump immediately recognised him and European Union nations backed Mr. Guaido, though some have been nervous over the global precedent of a self-declaration. The Ministry of Home Affairs in collaboration with the Ministry of External Affairs and National Disaster Management Authority (NDMA) is organising a meeting of Indian Ocean Rim Association (IORA) Cluster Group on Disaster Risk Management (DRM) on 5-6 February 2019 in New Delhi. Indian Ocean Rim Association is an inter-governmental organisation and has many disaster-prone countries among its 22 members and nine dialogue partners. DRM is one of its priority areas and its Action Plan (2017-2021) has specific goals to improve resilience in IORA countries. The two-day meeting will feature interactive sessions and will focus on development of a draft Work Plan for DRM in IORA. It will also deliberate on the need for establishing a DRM Core Group to take forward the agreed objectives under the Work Plan. It would strengthen cooperation in disaster response interventions, including deployment of response teams and mobilization of relief material to affected countries. Deliberations at the meeting would also aid information exchange, establishment of disaster databases and sharing of best practices. Trailing by 119 runs at the start of the second innings after Darren Bravo’s ultra-patient half-century extended the West Indies first innings total to 306 in the morning, England was demolished for 132 with Roach and Holder claiming four wickets each.